That's what my beautiful friend Rebecca said to a cute guy in the library from her vantage in the expandable stacks. You could say that everything is getting cheaper except for almost everything you need. We need places to live, energy to move, education to move up, and insurance to stay healthy. The productivity revolution isn't doing much to make those things more affordable. The reason why toasters are cheap and health insurance is not is that the productivity gains that made toasters -- not to mention computers, media*, durable goods, food, and clothes -- more affordable are not spilling over into health care. The next chart from McKinsey tells the story: More than half of total productivity growth comes from computers and information technology. Practically zero comes from health care and education. In fact, one reason why heath and education are adding the most jobs today is that employers can't meet new demand with technology or offshoring. They have to keep hiring people. From 1970 to 2010, real GDP doubled while real earnings fell by 28 percent. Two labor trends helped to offset this reversal. First, and very happily, women stormed into the workforce and supported their families with income. Second, and less joyously, everybody worked much harder. The typical two-parent family worked 26 percent more hours in 2010 than in 1975 but the middle class still feels incredibly squeezed. There is so much damn text in these ads. You're basically expected to read a short story to get the gist. Electronics are generally marketed to a much younger demographic now. It seems like adults copy their kids when deciding what kind of phone, etc. to buy. It feels like half the ad space in, say, an old LIFE magazine are devoted to booze and cigarette ads. These ads are hilarious: They all deliver a "You deserve it!" message. The cigarette ads depict stuff like a sweaty dancer having a smoke in the studio after ballet class. You've earned it! The booze ads show middle-aged, middle-class white people in sweaters sitting around in groups laughing while they drink brandy and obscure liqueurs on the rocks. Stuff like Midori and Galliano. You deserve it! Again, booze ads these days are mostly targeted at college students and 20-somethings it seems: what to drink when you're hitting da clubz (probably vodka). "When you're feeling a bit bored by your usual -- try it on the rocks. If you're more bored than usual -- try it in a snifter. Of course, when you raise your glass, you'll also raise a few eyebrows. But surely you've done that before." Really? 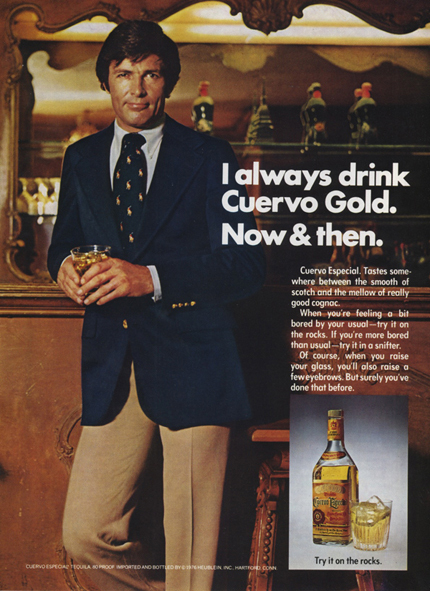 Did this ad convince anyone tequila is a classy alternative to scotch? In another ad there's a guy with the exact same haircut and smug expression saying, "Bourbon? No thanks. I've switched to Gold Rum and soda. It's smooth, it's light." "A Harvey Wallbanger is more than just a gold-plated screwdriver. It's the party drink of the decade." "First there was light. Followed soon thereafter by man and woman, a.k.a Adam and Eve. Then came the business with the apple, and before you could say, 'You snake in the grass,' five zillion years went by. But all wasn't for naught, because that fateful faux pas not only altered the history of haberdashery but also inspired the creation of DeKuyper Original Apple Barrel Schnapps." "When you go south with Avocados [sic] and Jose Cuervo almost anything can happen. And usually does." Unrelated: Here's an unexpectedly dire caption below a cuddly animal photo in the September 1984 issue of LIFE (featuring Michael Jackson on the cover): "At dawn a lioness nuzzles a cub whose mother, along with the rest of the pride, is gnawing on a wildebeest carcass nearby." "Gnawing on a wildebeest carcass nearby" is my new away message. Reading: The Heart Is a Lonely Hunter. I believe someone recommended this back when I was looking for non-YA novels with smart young characters. I do like the Mick character very much; she's a tomboy with a passion for music. I also started The Unconsoled a while back, but I'm not good at reading multiple novels at once. On Friday I got myself a Denver Public Library card and checked out some Alice Fulton books, one poetry and one nonfiction. Eating: Colorado peaches. New Mexico green chiles (and salsa made thereof). Boiled kale as an all-purpose vegetable (on pizza, in fried rice and scrambled eggs, etc.). Flax seed oil (trying to be one of those people). Salami (one of those meat products that tastes how I remember it tasting, rather than a gamier version of itself). Doing: Hiking a bit: we went to Lost Lake outside Nederland, CO, yesterday, which was a delight. (Yes, there was snow on them thar hills.) Shopping too much (post-move, I've lifted the self-inflicted moratorium on buying things I don't need). Today I bought a dress that looks like TV static. Playing Rock Band at Kevin & Katie's in Lafayette. Limited song choice, but I had much fun on "Stop Me If You Think You've Heard This One Before" and "Love Is a Battlefield." Vanity Update: My hair and skin look way better out there. Hair is sort of a who cares, but I can't get over the difference in my skin. I look three years younger! Hallelujah. I hope it lasts.